After a summer of use, here’s my evaluation. Overall, the tent earns two thumbs up. The pole structure is rock-solid. A long pole runs the length of the tent and then splits into two poles at either end via a circular hub system to secure the four corners. A second pole then goes cross-wise over the middle of the tent. Together the two provide a very stable design that flexes little in wind. 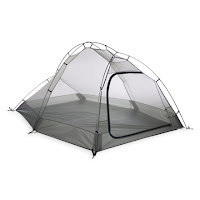 I was concerned about the amount of mesh on the tent; other than the floor, the entire tent body is mesh, which is one of the reasons the tent is so lightweight. In order to ensure that no condensation drips in from the inside of the fly, it is crucial that you be able to guy out the fly in such a way that none of it touches the tent body anywhere. This can be accomplished without too much trouble, though you do need to stake out the multiple guylines found around the base of the fly, a total of five points. Add in the two stakes you need for the vestibule, and you really need a minimum of seven stakes to ensure maximum water-proofness, plus ideally two more for the back two corners of the tent. Other good things about the tent. It’s super long. I’m 6’5″, which means that I don’t fit very well in backpacking tents that are less than 88″ long. The Seedhouse SL3 is a comfortable 90″. Three small pockets are built into the mesh walls, including a slick hidey-hole right above the door. Now for the nit-picking. The other big reason that the tent is so lightweight is the silnylon fabric used in the floor and fly. (For more about silnylon, see my recent article on the topic.) Several minor drawbacks accompany this fabric. First, it is much more elastic than regular nylon or polyester, which means that I noticed a significant amount of sagging between the warmth of late afternoon and the cool 30s in the early morning, which can bring the moist rainfly dangerously close to the tent body. I found that I needed to regularly retension the tent depending on temperature. Third, silnylon is very thin, which makes the floor particularly susceptible to puncture, especially if you’re pitching it over sharp rocks or forest debris. You can buy the optional footprint, but then you’re adding 9.5 ounces of weight, which is somewhat defeating the ultralight benefits of this tent. Other minor complaints: The fly features multiple guy-out points (pre-attached with guy lines when you buy it), but there is no way to secure these points to the poles themselves, a key aspect for stability in rough weather (see my July 10 post). The zipper on the door turns the corner with difficulty and can’t be closed or opened one-handed. Finally, the top of the rainfly door overhangs the main tent door, which means that any moisture that runs off from above the fly door drips straight into the head of the tent. 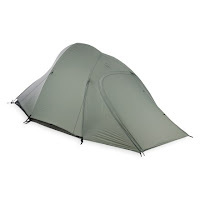 But overall, these are minor trade-offs for the exceptional low weight to space ratio you get with this tent. The bigger trade-off is cost. Like so many things in gear-land, you pay more (sometimes a lot more) to get less, at least in terms of weight. The Seedhouse SL3 sets you back $419. As for the Seedhouse SL2 and SL1: The SL2 ($319) is a little too short for me (84 inches) and lacks the second cross pole for stability, but would be a fabulous solo tent for anybody six feet or less or a great two-person ultralight option. The SL1 ($249), on the other hand, is one of the few one-person tents I’ve seen that is actually long enough for tall folks like me. It’s difficult to get in and out of, and must be fully staked out in all directions to gain adequate internal space, but it weighs less than some bivy sacks!